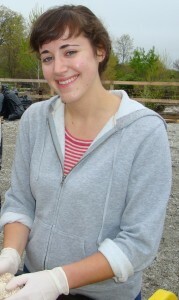 This project was conducted by Darcy Young (now in Amy Zanne’s lab at George Washington University) as part of her master’s research in the Hibbett lab of the Biology Department at Clark University, in collaboration with James Rice at the Brown University Superfund Lab. The goals of this project were 1) to assess the ability of wood-decaying basidiomycetes to degrade hyrocarbons in Bunker C oil (the primary legacy pollutant at the Fisherville Mill site), and 2) to investigate shifts in gene expression in the presence of Bunker C oil. For this work, we used “white rot” fungi, which produce enzymes that are capable of degrading lignin, a complex polymer in woody plant cell walls that is resistant to microbial attack. Darcy Young inoculating the mycoreactor at at the Fisherville site. 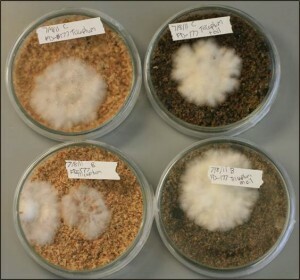 Fungal cultures on sawdust with (right) and without (left) Bunker C oil. We grew four selected species (Irpex lacteus, Trichaptum biforme, Phlebia radiata, Trametes versicolor, and Pleurotus ostreatus) in the presence of oil on sawdust media and assayed hydrocarbon degradation with gas chromatography-mass spectrometry (GC-MS). We also extracted RNA from cultures of a fifth species, Punctularia strigoso-zonata, grown with or without Bunker C oil present and assessed gene expression with RNAseq, taking advantage of the whole genome sequence of this species that has been generated by the US DOE Joint Genome Institute. GC-MS results indicate that the species we investigated were very effective at removing selected focal hyrocarbons, but transcriptome data were more ambiguous. A manuscript reporting this work is in preparation. This work was supported in part by a grant from the Mosakowski Institute of Clark University.